Explanation: What is that strange dark ribbon on the sky? 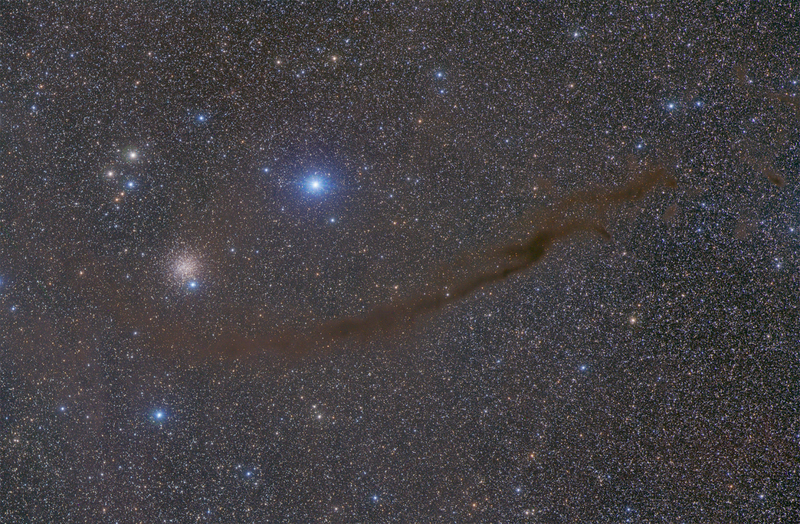 When observing the great globular cluster NGC 4372, observers frequently take note of a strange dark streak nearly three degrees in length running near it. Unnamed, the streak, actually a long molecular cloud, has become known as the Dark Doodad Nebula. (Doodad is slang for a thingy or a whatchamacallit.) Pictured above in a rich and colorful star-field, the Dark Doodad Nebula can be found sweeping across the image center. The globular star cluster NGC 4372 is visible on the image left, while the bright star gamma Musca is seen to the cluster's right. The Dark Doodad Nebula can be found with strong binoculars toward the southern constellation of the Fly (Musca). The above image was compiled by consecutive 45 minutes exposures taken by a small telescope from the La Frontera region in Chile.